The evening was to present the book, "Histoire de Boutenac" by Elaine Costas, a local historian from Boutenac. It was 30 December 2004. Then a surprise, a slide show of Lastours on the Montagne Noire, where Marie Elise Gardel, the archeologist in charge, has worked and studied for twenty years. I've read her articles in the French magazine, "Pays Cathare", and so I introduced myself to her. She was surprised to meet an English person who read Pays Cathare! She was so nice and friendly. I adored her presentation - pictures and proof that the Visigoths had lived at Lastours - indeed, Lastours was the border between the Visigoths and the Franks. Over the aperitif, I said that I found Visigothic history well hidden, and she agreed! She doesn't read or speak English, but she bought a copy of "The Visigothic Inheritance" for a friend who does. I was so impressed by her, an intelligent woman, passionate about her work, who has published many books, and who is interested in the Visigoths. I am in good company! 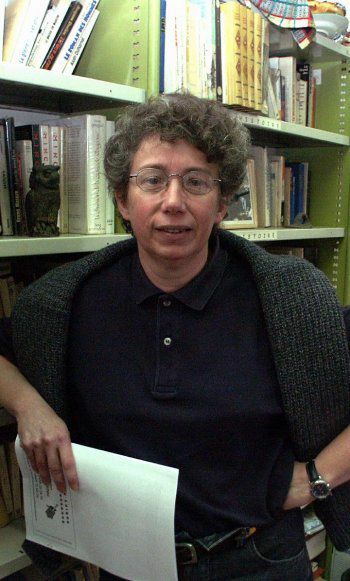 She is well known to SESA (Société d'études Scientifiques de l'Aude), and writes many articles for their annual bulletin or yearbook about recent researches. In 2009, she received the Légion d'Honneur medal. The local paper said; She loves photography and plays an excellent guitar, but above all, above all, is this medal. Petite, from Narbonne, as a child she already preferred the archeological museum to the beach. Today, alongside the prehistorian Jean Guillaine and the historian Guy Rancoule, the medieivalist Marie-Élise Gardel, is one of the great names for archeology in the Aude department. 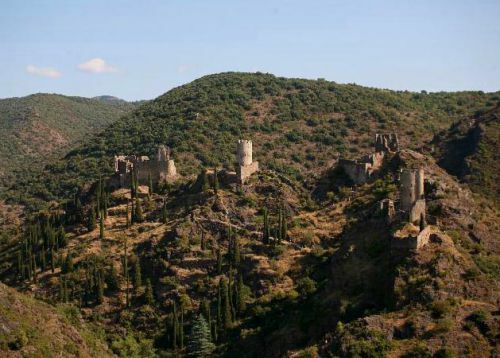 Her greatest work, and also the greatest moments of her life, is the discovery of this forgotten village at Lastours, called the "castrum" of Cabaret. Twenty-five buildings and 44 thousand objects were discovered. Research started in 1979, made successful by one thousand workers and supporters. In 1998, she created a work scheme at Lastours, employing about a hundred people over ten years to perfect the restoration work. "I have always considered it important to never lose the human view, and the problems of society at that time. Culture must not be an elitist activity." She has also researched Saint-Martin-le-Vieil, where the first cave-dwellers lived in Aude and the castrum of Saissac. She has written over sixty books and related articles. Her latest is La pierre, le métal, l'eau et le bois : économie castrale en territoire audois. "What pleases me most about archeology is the power to connect psychology with the discovery of our roots, with physical work, in the open air and to make contact with the earth." Marie Elise Gardel is also associated with UPVD - University de Perpignan/Via Domitia - where our friend Patrick, a friend of this site, studied three years to gain his degree in Visigothic Studies. Her books are available in all bookshops, some are even for sale at Atelier Empreinte in Rennes-le-Château!